Quality management has long been a goal and an aspiration of SPDs across the nation. But sometimes, in lieu of speed and efficiency, it takes the back seat. And without warning, simple mistakes can compound and turn into larger trends of neglect that run the risk of impacting patients. Without a strong foundation of patient safety, any effort in the SPD is in vain. And part of what makes up that foundation of patient safety is quality monitoring. Through the years, SPDs have always kept and been expected to do some type of quality monitoring—efforts that have been referred to as CQI (Continuous Quality Improvement), QA (Quality Assurance), or PI (Performance Improvement). Having a quality management system in place is one of the first and best steps that any SPD can take toward cultivating a culture of accuracy and quality. Although AAMI standards are released as recommendations for SPDs and professionals who work in the field, because The Joint Commission often uses them as guidelines for compliance, being compliant requires you and your team to be up to date in and in line with what AAMI recommends. That includes this recommendation for heightened quality assurance throughout the department by way of a quality management system. A systematic approach to identify and trend—Without having a clear process in place, it’s easy to gloss over missed details that seem like small missteps. Educating your team on the proper process after you create and implement one gives your team members a quick and easy way to report something that goes wrong. Define quality events—Different people see missteps or define lack of quality differently. Having a system in place to track quality can help to clearly define events in the SPD so that all team members are on the same page with definitions and what counts as a quality event. Development of performance measurements—If you want your team to grow and become more efficient, your quality management system can help you through the use of performance measurements. With them, you can help your team understand what’s expected of them and then measure performance on a daily, weekly, and monthly basis to see how well they’re measuring up. Determine and document corrective actions—Everything in the SPD needs to be documented. After you define quality events, it’s important to also set up corrective actions that need to take place when an event does happen so that team members understand the consequences and know which steps to take to fix the mistake that was made. Monitor any increase/decrease of the trend—Perhaps one of the best benefits of a quality management system is that it can help you figure out why certain quality events take place more than others as well as when they are occurring the most. Rather than guessing at where and why your team is struggling, you’ll get hard data that’ll eliminate all guesswork. 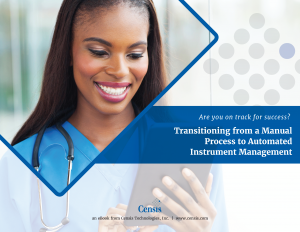 Because we’re in the business of helping teams like your’s run smoother through complete and transparent surgical asset tracking and management, we want to make sure you’re set up to be compliant with ANSI/AAMI ST90. We know how important quality is in the work that you do, and that’s why we built in a Quality Feedback module into CensiTrac, our flagship asset management tool. Our Quality Feedback module increases accountability and transparency by encouraging your team to communicate openly about situations that are both good and bad. As team members report on events, they are able to capture images or upload photos to better illustrate what took place for their managers to review. Managers can then log in and see all open cases from their employees that are waiting to be resolved. They can also pull reports on multiple parameters like event type, asset type, responsible party, and more to track and analyze overall team performance and quality. Tools like our Quality Feedback module not only ensure a high level of quality in daily work, but they also empower teams to build stronger relationships within and between departments. Curious for more ways that you can use simple steps and tools like quality management to build a better, stronger, and more efficient team? Check out our free eBook on Developing a Collaborative Team.